Box of Happy Accidents: A still-good collection of surprise awesomeness. 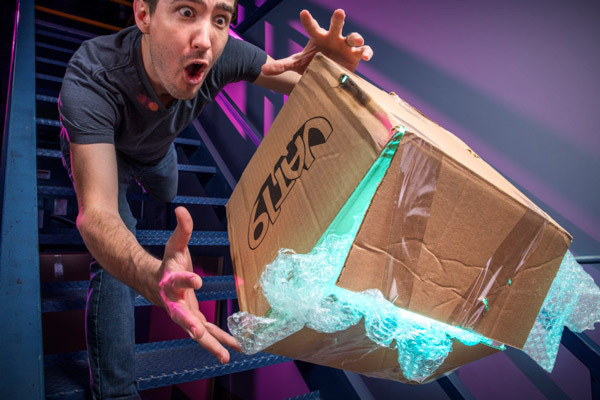 At Vat19, we pride ourselves in finding awesome gifts. We also pride ourselves in only shipping gifts that live up to their full awesomeness. So if we receive a crate of thinking putties with a dent in the tins, a whole lot of giant hard candies with hairline cracks, or a pallet of the wrong color of slushy makers, we don't feel good shipping these slightly imperfect (but still awesome) products to an unsuspecting customer. However, we have no scruples about shipping imperfect but awesome stuff at a discounted price to suspecting and expecting customers. That’s why we’ve put together goodie boxes of happy accidents for you to buy! Think of it like Vat19's Mysterious Box of Mystery...in the scratches and dings section of the store. 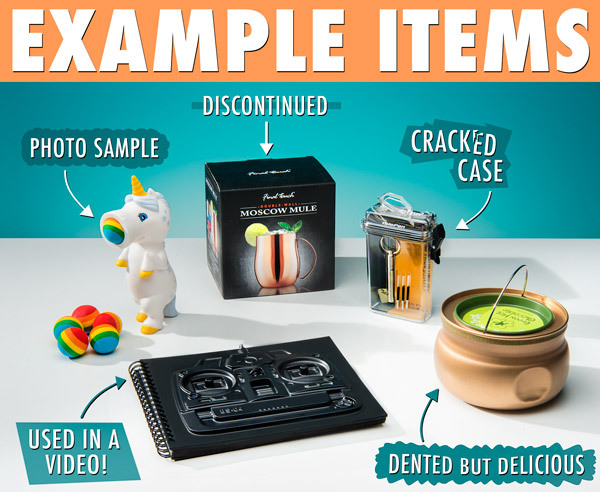 As a bonus, the curated collection of goods could contain a sample used for web page photos or the video, so you might end up getting something Internet famous! Note: Sometimes we end up with a whole bunch of screw-ups at the same time, so there's always the chance that the contents will be the same if you order multiple boxes at once. You don't know what's in the box. Size and shape of the box may vary from what is pictured. 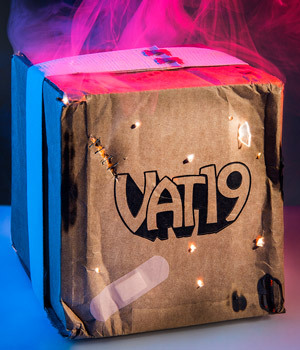 Vat19 stakes its reputation on delivering curiously awesome goods to your doorstep that you can be proud to gift to others (or keep for yourself). That means for every product that passes through our warehouse, you can be sure of two things: when you buy a product, you know it's going to be just right, and even the stuff that's not quite right is still awesome. Now's your chance to get a great deal on the latter. Each box is stuffed with a selected assortment of character-laden goods. Perhaps the packaging isn't quite up to snuff, but the product still passes muster. Maybe the manufacturer decided to stop making more of them. Or there's a possibility that we needed to take the item out of the box to get a snapshot of it for our website. Whatever the reason, if you're comfortable getting a grab-bag of imperfect but interesting merchandise at a great price, you’ll be perfectly happy with the Box of Happy Accidents. An island of misfit toys. Question: So what's in the box? Answer: It changes all the time, so if it's in stock, buy one and find out! Question: Will the box look like the one in the picture? Answer: The image at the top of the page is meant to illustrate the scratch-and-dings nature of the package, but your order will arrive in a non-distressed Vat19 box.